In these programs life is examined in terms of habitat, diversity, adaptation, ecological niches, and interrelationships. Modular presentation, stunning biological photography, and up-to-date learning design create a powerful teaching resource for the study of aquatic and marine life. 00:01:54Introduction to the study of seashores. 00:05:17What causes tides? See animations of the Abiotic and Biotic Conditions on the shore. 00:04:34Wave Shock and Defense: Adaptations for surviving desiccation, and variable salinity, Competition for space and the seashore food base, wave shock adaptations, structural, chemical and behavioral defense adaptations. 00:03:25Feeding on the seashores includes suspension feeding, detritus feeding, grazing and symbiosis. 00:04:46Seashore reproduction includes asexual and sexual reproduction, hermaphroditic mating, broadcast spawning, sea urchin development, and planktonic larvae. 00:04:36Rocky Shore Habitat and Zonation: Intertidal zonation and characteristic species of rocky shore zones. 00:04:40Sandy Beach/Mudflats/Docks: Sandy beach and meiofauna, estuarine, ecology and explore life on docks and pilings. In this program life is examined in terms of habitat, diversity, adaptation, ecological niches, and interrelationships. 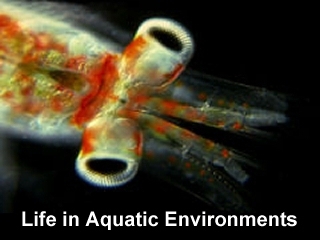 Modular presentation, stunning biological photography, and up-to-date learning design create a powerful teaching resource for the study of aquatic and marine life. 00:01:34Learn what makes a pond, a lake, or a wetland? 00:15:35The Weedy Shallows: This unit places many of the organisms studied in biology into an ecological perspective: hydras, planarians, annelids, aquatic insects, rotifers, and protists, all interesting organisms that provide food for fish and other vertebrates. 00:05:25Adaptations for planktonic life are observed in Daphnia and other cladocerans, copepods, rotifers, and planktonic algae. 00:03:00Explores bacterial decomposition, recycling of materials, adaptations for bottom life, and ecological relationships in the planktonic community. 00:02:56This section takes a revealing underwater look at the highly specialized organisms that live in reapids, under-rock communities, and in slower waters. 00:09:42Investigates adaptations for life in temporary wetland environments - the Vernal Pool. Seasonal temporary wetlands, commonly known as vernal pools, are a menagerie of diverse and fascinating organisms. This program contains two parts: a non-narrated observation section and a fully narrated instructional section, including tips on how to collect and examine live organisms in the classroom or lab. 00:00:48Algae are diverse single cell organisms that photosynthesize. In the Vernal Pool, the microalgae are the early food source for crustations. As the pool fills the cysts hatch. As the pool dries, the microalgae feed insect larvae. 00:01:43This includes video decomposer bacteria, Cyanobacteria and others in Vernal Pools. 00:01:39Rotifers: This program includes the smallest animals in the world, free-swimming and includes colonial varieties. 00:02:02In the programs two flatworms are featured as a predator and a farmer. These species host algae cells within its body. 00:00:39Ostrocods are tiny crustaceans that feed on detritus. 00:01:21Water fleas: This overview featuring Daphnia. Presenting eggs and physiology. 00:00:45Copepods are the most abundant crustaceans on Earth. 00:00:55Clamshrimp: found only in the muddy bottom of vernal pools. 00:00:39Fairy Shrimp: They filter the water to feed on microorganisms. 00:00:47Tadpole Shrimp: another of the three Eubranchiopods studied. 00:02:50Insects: Larval stages of damselflies, dragonflies, diving beetles and midges. Backswimmers are also shown.